In Buggy Breakout, spring has sprung, bringing...bugs? 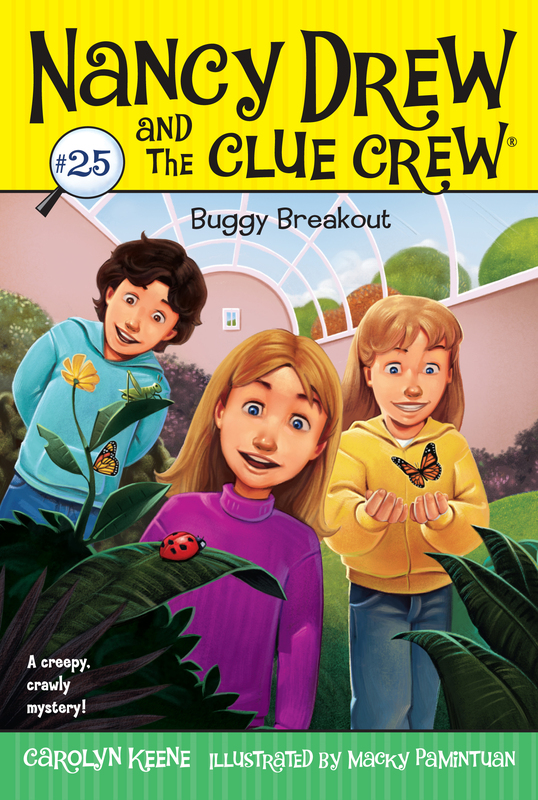 The Clue Crew must use their best detective skills to recover the Bug Club’s prize insect. “I love Bug Week!” Nancy Drew said, doing a little skip as she walked down the hall toward class. “Me too!” her friend George Fayne piped up. “Me three!” Bess Marvin added. “Check out my cool bug outfit!” She twirled around, showing off the red ladybugs on her white T-shirt. The pockets of her jeans were embroidered with different-colored butterflies. Nancy giggled. Leave it to Bess to come up with a fashion statement about bugs. Bess was way into clothes. George, Bess’s cousin, was more into sports. This week was Bug Week for the third graders at River Heights Elementary School. The girls’ teacher, Mrs. Ramirez, was teaching the students all about insects. The day before, they had watched a cool movie about common bugs and their habitats, or homes. Today they were going to make bug posters, and tomorrow they were going on a field trip to the new River Heights Insectarium. Nancy couldn’t wait! “Yes, Michael D.?” Mrs. Ramirez said. She called him that because there was another Michael in the class: Michael Lawrence, or Michael L.
Michael D. sat up very straight. “All insects have a head, a thorax, and an abdomen. What is a thorax? A thorax is the part of the body between the head and the abdomen.” He spoke precisely, like a scientist. Nancy stared at Michael D., impressed. He sure knew a ton of stuff about bugs! “Very good, Michael D.,” Mrs. Ramirez said. “Can anyone tell me if spiders are insects?” Michael D.’s hand flew into the air. “Someone other than Michael D., that is,” she added. “Hmm. They’re definitely creepy-crawly. But are they insects? Anyone else?” Mrs. Ramirez peered around the room. Sonia Susi put her hand up. “Actually, they’re not insects. They don’t have antennas. And they don’t have compound eyes.” She turned to Luna. “I’m kind of scared of them too,” she said with a grin. Michael D. raised his hand again. So did Nancy. “Nancy?” Mrs. Ramirez said, pointing. “She said an insect,” Nancy whispered back. “Can I draw Bess Marvin?” Michael L. joked. Bess whirled around and glared at him. “Yes, of course, Sonia,” Mrs. Ramirez replied. Nancy glanced over her shoulder at Michael L. He was bent over his notebook, doodling something that looked like a big, fire-breathing dragon. He wasn’t paying the slightest bit of attention to Sonia’s announcement. Nancy was surprised that he was a member of the Bug Club. He didn’t seem that interested in bugs. Yesterday, during the bug movie, he had gabbed with Antonio Elefano the whole time and gotten in big trouble with Mrs. Ramirez. © 2010 Simon & Schuster, Inc.